TSG Multimedia TSG Multimedia is a video production company specializing in railroad-themed subjects. This unit was one that I kitbashed myself before Atlas brought out their excellent B23-7 model. I built the shell using Bachmann and Athearn parts, along with a ton of small details. Older brass models are not typically DCC ready. This is not a brass model, but it has an Overland drive that is similar to those used in many Overland and other brass imports. On the DVD I show how I installed an ESU LokSound 3.5 decoder and speaker, including wiring the headlights and gyralights. 2 (start speed) 3 This controls the minimum voltage applied to the motor at speed step 1. 3 (acceleration) 26 This controls how quickly the locomotive changes speed when accelerating. 4 (deceleration) 22 This controls how quickly the locomotive changes speed when decelerating. 5 (top speed) 62 This controls the maximum voltage applied to the motor at full throttle. 6 (mid speed) 32 This controls the voltage applied to the motor at half throttle. 17 (extended address) 211 For locomotives with a 4-digit address, CV 17 and 18 together determine the address. To be honest I never try to set these manually. My Digitrax system does all this automatically for me when I program a 4-digit address. 29 (configuration) 38 The setting of CV29 is complex. See your decoder instructions. 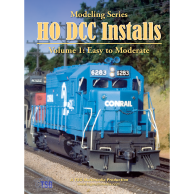 Your DCC system may set CV29 for you when programming your locomotive’s address. If you need to modify CV29, it’s best to do it after setting the address. 53 (control reference) 25 Reducing this value from the default has the effect of lowering the starting speed of the locomotive (though it is still good with the default value). LokSound decoders are great at low speed crawling, making for amazingly smooth starts and stops. 63 (volume) 32 This is the overall sound volume. 121 (volume) 64 This is the horn sound volume. 122 (volume) 18 This is the bell sound volume. 123 (volume) 15 This is the auxiliary sound volume (prime mover, brake squeal, and everything else). 172 (F5 button forward B) 1 Setting this variable to 1 prevents the locomotive from slowing down when dynamic brakes are turned on with the F5 button. Though I’m happy overall with how my B23-7 turned out, now that the Atlas model is available I don’t think I want to repeat the exercise. The whole mess started back in the early 1990s when I bought an undecorated Bachmann Spectrum B23-7. Unfortunately the more I examined the model, the more I found wrong with it. I ended up scrapping the drive and cab and just keeping the shell. Later I added an Athearn cab, and bought an Overland drive to power it. The Overland drive runs smoothly but it is noisier than I like. I think this is because it has an individual gearbox on each truck. This allows each axle to be individually sprung, which is neat to watch when it goes over rough track, but at the same time all those gears are noisy even with lubrication. To be honest my Atlas UP B23-7 runs better and is quieter. The Overland fuel tank was also not the right shape, so I had to go at it with a file and sandpaper and spend a few hours sculpting it. The air reservoirs were badly modeled, too, so I replaced those with castings and plumbing from Details West. The LokSound 3.5 delivers outstanding performance and solid sound. I especially like the fact that the LokSounds don’t generally require much if any CV tweaking to achieve stellar performance. 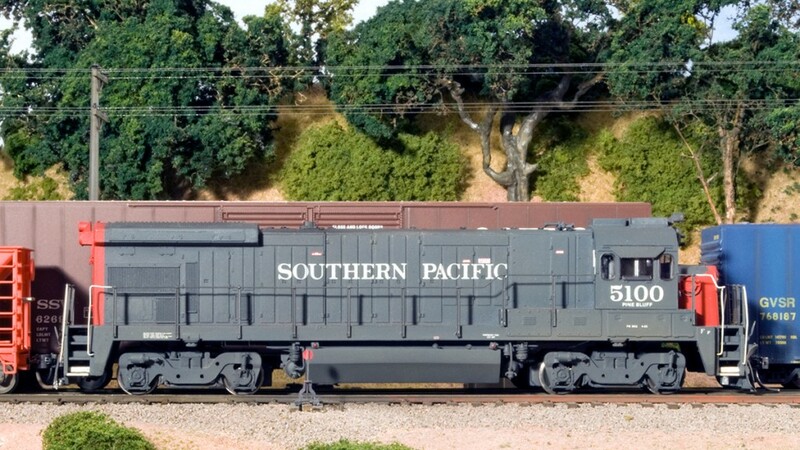 I have tried many brands of decoders and I have yet to find anything that will make a locomotive run better than a LokSound. The sound quality of the LokSound 3.5 is largely dependent on the sound set that’s programmed into the decoder’s memory. The GE 7FDL-12 sounds in the decoder I used for this model are pretty good, with that characteristic GE burble. The Nathan 3-chime horn sounds reasonably like an SP horn to my ear. The LokSound 3.5 has the ability to load different or customized sound sets if you have a PC and the ESU LokSound Programmer hardware/software package. Thankfully, though, all of the features of the decoder aside from loading new sounds are accessible via CV programming. Mac users need not feel left out. I have a Mac and run the LokSound Programmer software under Windows 7 using Parallels Desktop, an application that allows you to run PC software on the Mac! Daniel Cortopassi has contributed to TSG Multimedia part-time as an independent contractor since 2005. © 2019 TSG Multimedia. All Rights Reserved.